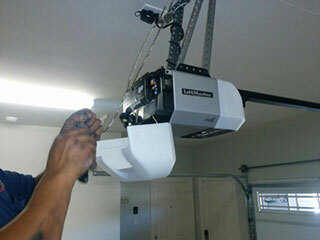 Your garage door opener helps you quickly and efficiently get in and out of your garage each day. When it's working well, all you need to do is push a button and move on with the rest of your day. Sadly, there are all kinds of issues that could leave your opener malfunctioning or simply not working. Whether your opener is making strange noises, vibrating or moving too slowly, professional repair work is required. You can extend the life of your existing system instead of buying a new one. No matter how handy you are, repairing a garage door opener is extremely dangerous, and should only be attempted by professional technicians. From cuts and injuries caused by the unit's various moving parts, to potential electrocution, there are too many risks involved, not to mention you could also make the problem get worse, or void your manufacturer's warranty. Be sure to contact our experts no matter how small the problem you are experiencing seems to be. Regular maintenance can do more than prevent a sudden malfunction with the performance of your garage door opener. It can also make sure that your entire system continues to operate at an optimal level for as long as it possibly can. Repairing your existing system is typically more cost-effective than replacing it. When you want to upgrade your garage door opener, you don't necessarily have to change all of your remotes. Instead, you can count on us to professionally sync your old remotes with your new opener, provided they are compatible. Be sure to consult us before you buy. Contact Our Experts at Garage Door Repair Santa Monica Today! Our specialized technicians are ready and willing to help you with all your opener related needs.